Home / See & do / Top Sights / Top 10 / Mons with the family / Time for bed! / Mons and its treasures / Saint Georges, a unique apartment-hotel! Then try out “Hôtel Saint Georges,” an apartment-hotel located close to the Grand-Place in Mons. Stay in a charming apartment in a mansion, and you’ll feel at home. Want to discover the treasures of the city of Mons? 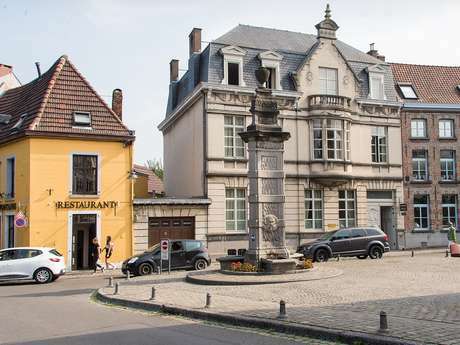 The hotel is located in the heart of Mons, not far from SHAPE. Visit the city’s must-sees sights like the Grand-Place, Belfry or Doudou Museum. If the animal world sounds familiar to you, why not go to Pairi Daiza wildlife park! For some downtime, relax in the garden and reception area. After a long day, you deserve it. If there are lots of you, why not opt for connecting rooms! Then you can stay together during your stay. It’s good to be at home.